I requested this book from NetGalley not really knowing too much about what this book was going to be about and I think that's one of the things that held me back from really enjoying it. I'm here with another book review, So Glad To Meet You by Lisa Super. Thanks so much to NetGalley for sending me an eARC of this book for an honest review, as always, all opinions are my own. 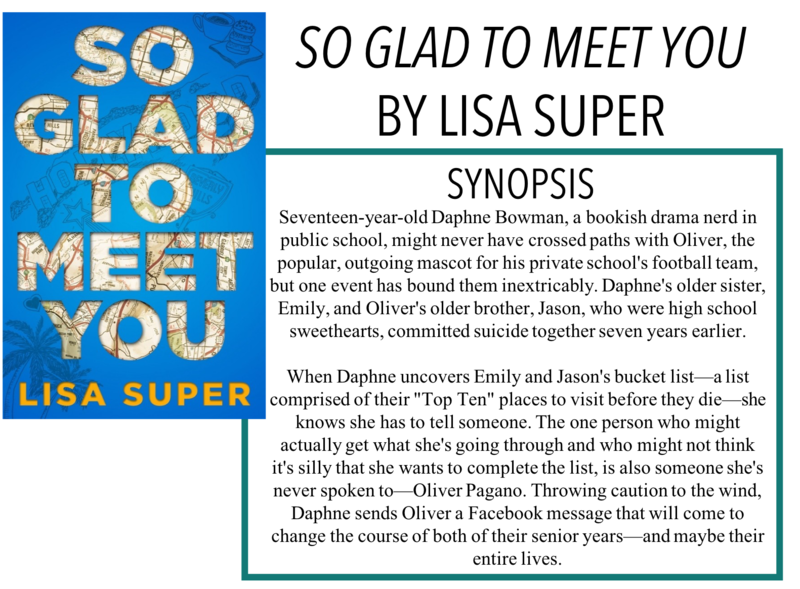 This book follows Oliver and Daphne, the younger siblings of high school sweethearts Jason and Emily. After Jason and Emily committed suicide seven years ago after battling depression, their families have struggled to deal with the loss. Daphne's parents have become distant - her father has turned to alcohol to cope and her mother works herself to exhaustion, and Oliver has committed himself to be the polar opposite of his brother. After finding a bucket list of sorts, Daphne enlists Oliver to complete everything Emily and Jason didn't. So, I knew there was going to be a romance. You just ~ cannot ~ have a book these days without a romance in it. For the most part, I didn't mind it. But there were just some points where things weren't working out and I felt like things were pushed a bit too much. Eventually, you can see some chemistry between Oliver and Daphne, but there was a lot of drama involved beforehand to make it work. This book also deals with mental illness and suicide. It's talked about quite a bit by the characters and I think that Super does a good job of relaying Oliver and Daphne's reactions. The book also takes place many years after the fact so their reactions to things have had a chance to settle a little. The grief was still current, but really, this was more of a romance than a mental health novel. I found the writing to be decent. It took a little to get used to but once I did, I was quick to finish the book. I would say that it is a pretty character-driven book - the main focus was on Oliver and Daphne and their relationship, even less so on their grieving. I don't necessarily think this was a bad call, but I do think I might have enjoyed it better if there was more to the plot. Overall, there were some just general book aspects that didn't do any favours for me - young sounding narrators, third-person POV, high school setting, etc. and I think, in the end, this was a romance with some grief, not a grief story with some romance.